An optical fiber cable uses light wave for voice and data transmission, its data transmission capacity is 4.5 times more than conventional copper cables. So in the past several decades, we have seen that fiber optic cables are superior to traditional copper twisted-pair cable or coaxial cable because of its unique physical characteristics, allowing information to travel at speeds increasingly approaching the speed of light without interference between adjacent wavelengths. In leading market, the global drive to implement FTTx into more new venues is good news for the market of optical fiber cables. Another good trend is that the price erosion of optical fiber cables had been 10 to 15 percent annually, in result that the demand of optical fiber cable is expected to continue growing in the foreseeable future. And the growing data transmission workloads placed by high-performance computers, servers and network storage systems is helping spur growth in the market. Consequently, fiber optic cables are now the indispensable backbone of today’s communication network. This article will analyse the global optical fiber cable market in three main applications, including long-distance communication, submarine cable and FTTx network. According to the report “Fiber Optics Market by Cable – Global Forecast to 2021”, the optical fiber cable market is anticipate to grow at a CAGR of over 9.8% during 2016-2021. The growing importance of cloud computing, data transfer & storage, and IoT is driving the use of Internet, which is driving the fiber optic cable market, as it acts as the backbone for data transmission. Moreover, growing technological advancements increase in number of connected devices and data centers are expected to positively influence global optical fiber cable market. In addition, next generation technologies such as LTE and FTTx, which require last mile connectivity, is expected to propel the demand for optical fiber cables in the coming years. 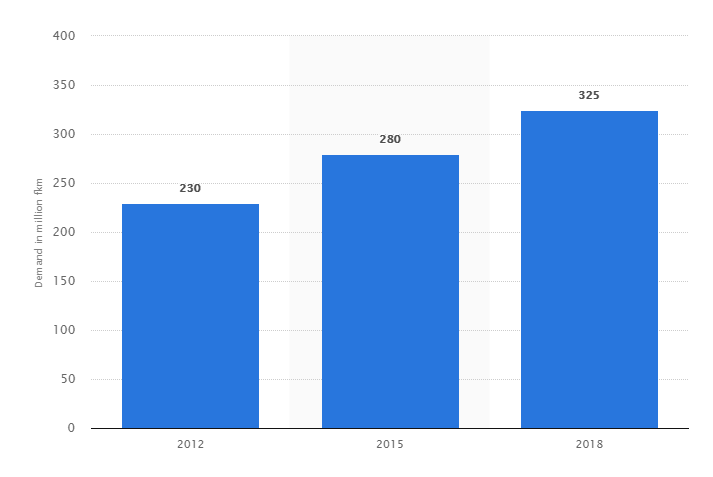 All these factors have led to an increase in Internet users, which in turn has led to the higher usage of optical fiber cable to transfer information over the Internet, thus driving the fiber optics market. Currently, the growing adoption of optical technology in the telecommunications appears to be promising. Optical fiber has virtually unlimited capacity and low signal attenuation allowing long distances without amplifier or repeater, no exposure to parasite signals or crosstalk, and no electromagnetic interference (EMI). So fiber optic cable is especially advantageous for high-speed data transfer services in long-distance communications over electrical cabling. Furthermore, the increasing cloud-based applications, audio-video services, and Video-on-Demand (VoD) services further stimulate the demand for optical fiber cable installations. Submarine optical fiber cables are undersea cables used for carrying data across interconnected networks between continents. 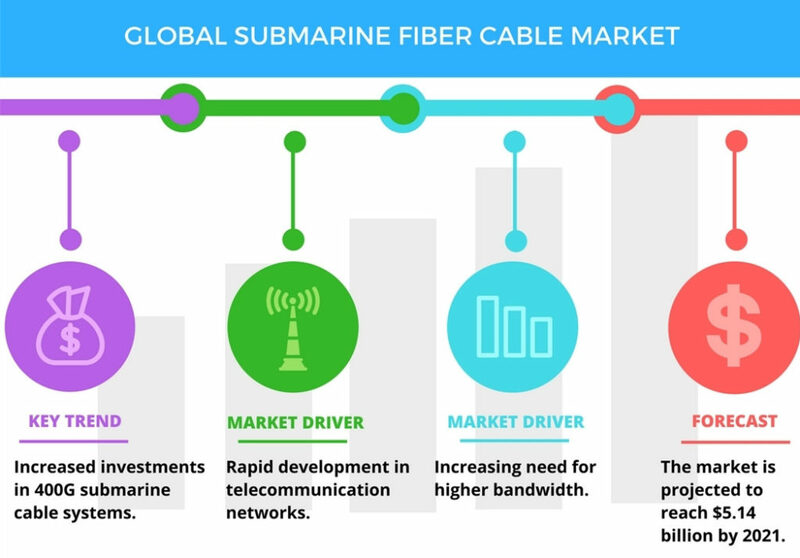 With the advancements of technology, most of the submarine optical fiber cables that currently form the backbone of the Internet connect the U.S. to Europe and Asia by crossing the Atlantic or Pacific oceans. Instead, there is a proposal for deployment of Trans-polar submarine cable system in Arctic Ocean. Laying an undersea fiber optic cable is meant to connect Asia and Europe by crossing the Arctic Circle – the shortest practical distance yet for Internet signals traveling between the two continents. According to the report by Global Industry Analysts (GIA), cumulative installations of submarine optical fiber cables globally are projected to reach 2 million kilometers by 2020, driven by the growing demand for fiber broadband and the ensuing deployment of fiber optic cables in the Internet backbone. Presently, submarine optical fiber cables transmit 100% of the international Internet traffic, and more than 95% of the world’s combined data and voice traffic. In recent years, the market for optical fiber cable has shifted dramatically to local deployments, away from long haul and regional. This is the impact of FTTx, which calls for far more dense applications in neighborhoods, cities and other highly focused areas. Optical fiber cable is being caught up in the global move to broadband in the near future. 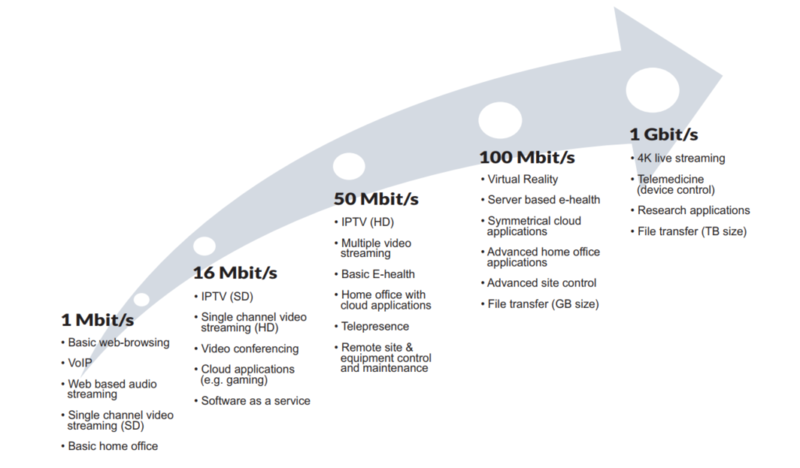 The next generation of high bandwidth applications, along with the proliferation of connected devices, is expected to require faster and higher bandwidth networks which will require the use of multimode fiber cable for data transfer. This growth in the FTTx networks in turn is expected to drive the fiber optics market. Future Market Insights (FMI) forecasts the global fiber to the home (FTTH) market’s value will grow from $9.5 billion in 2017 to more than $37 billion by the end of 2027, a 14.4% compound annual growth rate (CAGR). 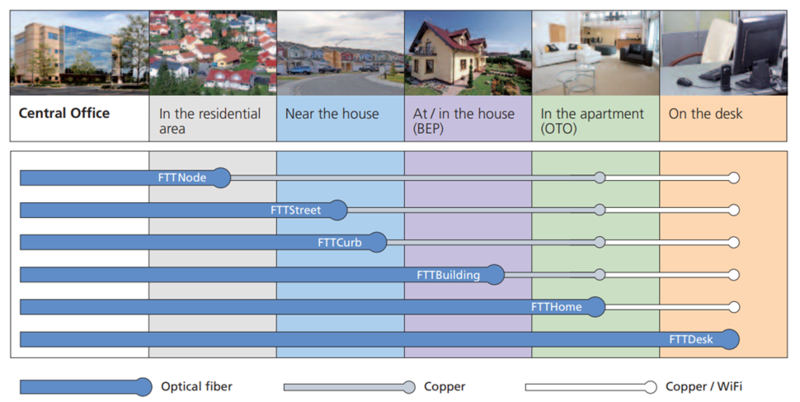 In the leading Asian economies, more than 44% of all homes and buildings are already directly connected to the fiber optic cable network; in North America penetration is 8.4%, in Europe 5.6%. Fiber optic cable is widely used for data transmission and is increasingly being used in place of metal wires because of its efficiency and high transmission capacity. Since the use and demand for great bandwidth and fast speed, there is no doubt that fiber optic transmission will bring more opportunities and be continuously researched and expanded to cater for future demands. However, although fiber optic cable in itself is considered a long-term stable investment, it also faces huge challenge. The major restraint in the fiber optics market is the growing use of wireless communications systems in remote areas.